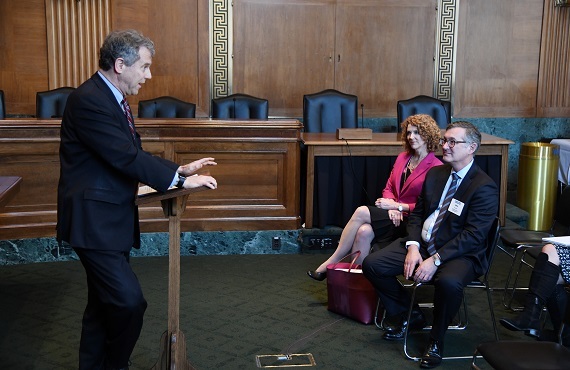 Last week, CSBS hosted 75 regulators from 42 states at our 2019 Government Relations Fly-In. Over the course of several days, we met with leaders at the Federal Reserve Board of Governors and FDIC, as well as leadership of key financial services committees in the House and Senate. Ensuring a simplified capital framework for community banks: We are concerned that as proposed, the community bank leverage ratio (CBLR) will not provide the relief intended by S. 2155. By proposing an alternative prompt corrective action framework, the agencies are raising capital standards. Last week was a critical opportunity to continue to express our views to the agencies as well as highlight this issue with members of Congress. Appointing an FDIC board member with state bank supervisory experience: We want an individual with state bank supervisory experience to be named to the FDIC board, as required by federal law. There are two current vacancies on the board, making this a perfect opportunity. In addition to being federal law, a director with state bank supervisory experience expands the FDIC board’s knowledge base to include a practitioner with direct experience of the approximately 4,400 state-chartered banks that make up 79% of the nation’s banking system. That is important, as the FDIC coordinates with the states to examine most of these banks. Promoting Vision 2020: The initiatives to modernize and harmonize nonbank state supervision are extremely important to CSBS and our members. We want a system that serves local needs but works efficiently. Last month we announced our next steps to create uniform definitions and practices, increase transparency and expand the use of common technology based on recommendations from our Fintech Industry Advisory Panel. We have a number of other initiatives underway that are intended to increase transparency, improve communication and enhance technology and automation. The appreciation and understanding of these initiatives by policy makers are critical to their success. Supporting Community Banks and Innovation: This is an important part of Vision 2020. Banks, particularly community banks, rely on outside vendors for a variety of services and look to leverage technology partners. We developed federal legislation (H.R. 241) to amend the Bank Service Company Act to enable state and federal regulators to better coordinate supervision of bank vendors. As currently written, the law effectively impedes coordinated state-federal third-party service provider supervision. We want to build on the momentum from the last Congress, when the House Financial Services Committee approved a similar bill by a vote of 56-0, drawing supportive statements from senior Republicans and Democrats. As I said, these fly ins are important. They give state regulators the opportunity to raise the policy issues that are important to us from a local perspective. Members of Congress appreciate the opportunity to hear from the officials from their states. Additionally, building productive relationships with federal counterparts helps ensure safety and soundness, protect consumers and economic growth and foster innovative, responsive supervision. Not to worry, the OCC says, because state anti-discrimination laws and fair lending laws would purportedly apply to these national nonbanks. We have heard this line before in the years leading up to the financial crisis when the OCC, among other things, extended national bank preemption to nonbank subsidiaries of national banks. In reversing this action through the passage of the Dodd-Frank Act, Congress describedthe OCC’s preemption campaign of the early 2000s as actively creating an environment where abusive mortgage lending could flourish without state controls in an effort to attract additional charters. A proposed new interagency rule intended to provide regulatory relief to community banks has too many obstacles to be effective; however, a few modifications would provide these smaller banks with the capital simplification intended by Congress, CSBS said in a comment letter to the OCC, Federal Reserve and FDIC this week. Last spring, Congress directed the federal agencies to develop a community bank leverage ratio (CBLR) in Section 201 of the Economic Growth Regulatory Relief and Consumer Protection Act. The goal is to provide qualifying community banks relief from the complexities and burdens of the current risk-based capital rules while ensuring that they maintain a high quality and quantity of capital consistent with requirements of the current rules. However, several provisions in the CBLR proposed by the federal agencies would discourage community banks from opting to use it. Through the public comment process, state regulators are hoping to ensure the proposed CBLR provides the intended regulatory relief – not regulatory burdens. In an earlier comment letter sent to the federal agencies in February, CSBS recommended eliminating the proposed new prompt corrective action (PCA) framework for banks that use the new CBLR. CSBS suggested the CBLR should use the current Tier 1 leverage ratio rather than creating a new capital measure, which would allow a community bank that falls below the CBLR to more easily begin reporting capital ratios under the current risk-based capital rules. The rule should provide a limited grace period to allow community banks to either come back into compliance with the CBLR or return to complying with the current risk-based capital rules. The CBLR should not include qualifying criteria for concentrations in mortgage servicing assets or deferred tax assets. These criteria are not necessary if the CBLR is a Tier 1 leverage ratio. The definition of “off-balance sheet exposures” in the qualifying criteria is overly broad and adds complexities rather than reduce burdens. The proposed rule should include language requiring federal agencies to notify state bank regulators when a community banks has opted out of the CBLR framework between reporting periods to fully meet the law’s requirements. The proposed rule should provide for state bank supervisors to be at least consulted by the FDIC or Federal Reserve in their discretionary decisions relating to community banks qualifying for the CBLR. Last week, Federal Reserve Governor Michelle Bowman pledged to re-engage with state regulators on the matter. Every year, CSBS conducts a nationwide survey of community banks. The video below highlights findings on how community banks engage in relationship lending.